Some of the most rugged sections of the Appalachian Trail go through Mahoosuc, but there are also some options that can please the senses and not ruin the body. It’s true, there is something onomatopoetic to the word – with its bold consonants and swooping vowels, it does indeed sound how the area looks. 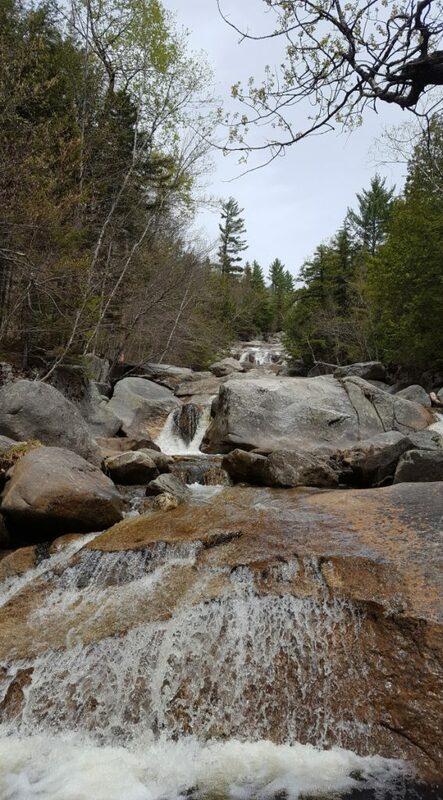 Encompassing a vast swath of land on the Maine-New Hampshire border, the Mahoosuc region is filled with towering summits, stony ledges, verdant woods, cool rivers and spectacular waterfalls – and lots and lots of hiking trails. Fifty-five of the Appalachian Trail’s 2,200 miles pass through the Mahoosuc region, over Goose Eye Mountain, Mahoosuc Arm, Old Speck Mountain and Baldpate Mountain. This is some of the toughest hiking on the entire trail – a through-hiker once told me that hiking through the White Mountains and the Mahoosucs is like “climbing straight up all morning and falling straight down all afternoon.” If you’re looking for some truly challenging hiking, you can section-hike this half-century stretch of the AT, or tackle the 39-mile Grafton Loop trail, which connects nine summits and traverses a nice section of the AT as well. But this column isn’t about those leg-burning, back-busting miles of the AT. Since this October marks the 30th anniversary of the initial formation of the Mahoosuc Land Trust, I spent a few trips exploring their properties in the Mahoosuc region. MLT conserves more than 8,000 acres, including properties in Shelburne, Upton, Gilead, Newry, Bethel, Albany, Greenwood, Woodstock, Rumford, Andover and Milton. These 27 properties contain more than 20 miles of hiking and walking trails, of varying difficulties – offering many opportunities to hike a la carte rather than consuming a whole meal of a section-hike. For a moderate but challenging day hike, I recommend Whitecap Mountain (also called Rumford Whitecap) on Route 5 in Rumford. Thanks to Whitecap’s bald summit and open ledges, you can take in breathtaking views in all directions for a relatively small amount of effort. There are two trails to the upper ledges: the moderate Red/Orange Trail, which begins across the road from the parking lot; and the steeper and rockier Starr Trail, which begins at the gate 100 or so yards up the road. They’re both about two miles long, and they meet just before at the half-mile ledge walk that brings you to the summit. Starr has some particularly nice views to the west, where it comes out of the trees earlier, so I recommend it for the hike up – but if you’re nervous around steep rocks or the weather turns slippery, it’s probably best to stick to the Red/Orange trail both ways as the upper part of Starr is quite exposed. From the summit of Whitecap you can see Old Speck and the Mahoosucs to the west; Ellis Pond and the mountains of Rangeley to the north; the back side of Black Mountain Ski Resort to the east; and the Androscoggin River valley to the south. In late summer you’ll also see many, many blueberries – the scrubby ledges on Whitecap are the perfect environment for them to run rampant. If you time your hike for peak blueberry season, you’ll want to bring a container to collect the sweet berries. In nearby Rumford Center, the moderate and much shorter Glassface Ledges Trail climbs almost a mile up the side of Glassface Mountain for breathtaking views of the farmlands along the Androscoggin. Park at the Hastings Landing Boat Launch on Route 2 (just east of the church) and cross through the cemetery to reach the trailhead. Despite its short length, the Glassface Ledges Trail passes through a number of distinct landscapes: old forest with towering trees just beyond the cemetery; bushy, open, recently logged slopes (wear long pants – the trail is a bit overgrown here); muddy streams with water bars; and finally, boulders and steep climbing through oak and pine. From the outstanding viewpoint on the ledges, a beautiful curve in the Androscoggin stretches out before you, with the Oxford Hills rolling away into the distance. On Route 26 in Newry, just east of Grafton Notch State Park, the small and lovely Step Falls Preserve is a stunning destination that barely requires any hiking. Just minutes from the trailhead, you’ll encounter wide Wight Brook; the lower falls are about half a mile up the trail, and the upper falls are a few hundred feet beyond that. The enormous granite slabs that create these “steps” in the hillside are the perfect place to stretch out in the sun for a picnic, and the cascades, slides and pools offer ample opportunity to get your feet wet. Finally, I recommend exploring the Valentine Farm Universally Accessible Trail, at the Mahoosuc Land Trust headquarters in Bethel. Throughout this summer I’ve tried to draw attention to universal access trails, which comply with the American Disabilities Act and provide increased access to explore the outdoors. This gentle 1.2-mile loop trail has a crushed gravel surface that’s perfect for strollers, wheelchairs, walkers and bikes, and features views of the Androscoggin River. There’s a lot more to the sonorous, evocative Mahoosuc region than the spine of its rugged mountain range. The hiking and walking opportunities that abound will have you conjuring up new adventures.